圖1. 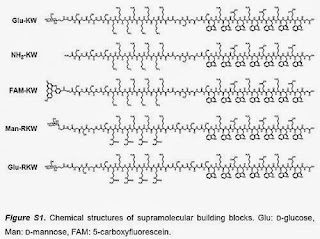 The researchers started with a ribbonlike protein structure (²-sheet) as their template. The protein ribbons organized themselves into a defined threadlike double layer that sets the shape and size. Coupled to the outside are "protein arms" that bind short RNA helices and embed them. 圖3. 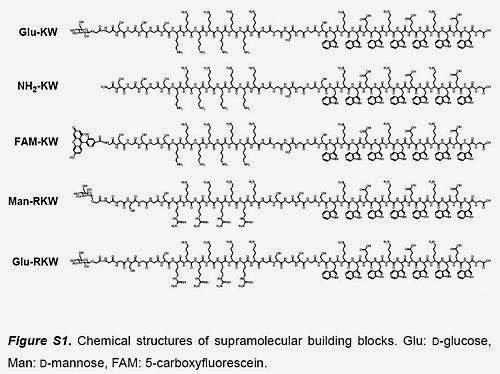 a) Structure of Glu-KW. 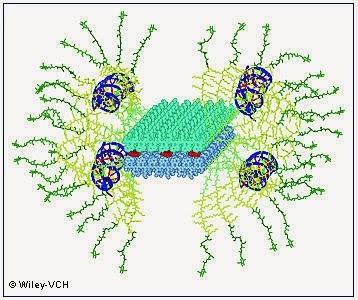 A -sheet peptide segment, nonionic segments (linkers and D-glucose), and a cationic segment are shown in blue, green, and yellow, respectively. 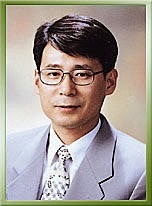 Glu: D-glucose. 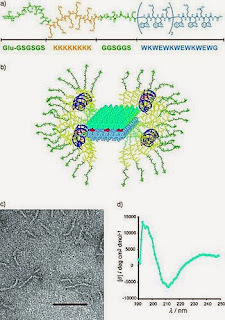 For structures of all the building blocks (Glu-KW, NH2-KW, FAM-KW, Man-RKW, and Glu-RKW; FAM=carboxyfluorescein, Man=mannose), see the Supporting Information. b) Molecular model of the artificial virus incorporating small interfering RNAs (siRNAs; blue, double-helix shape) and hydrophobic guest molecules (red). c) TEM image of a Glu-KW ribbon. Scale bar: 100 nm. d) CD spectrum of Glu-KW (15 M in PBS). 1. Yong-beom Lim, Eunji Lee, You-Rim Yoon, Myeong Sup Lee, Myongsoo Lee. 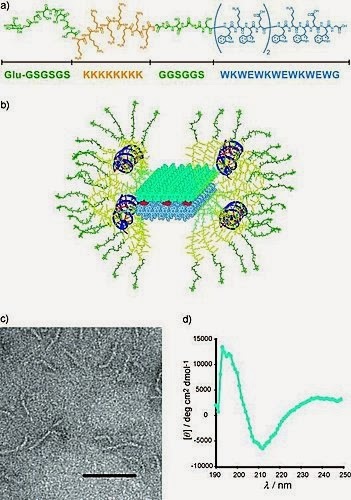 Filamentous Artificial Virus from a Self-Assembled Discrete Nanoribbon. Adapted from materials provided by Wiley-Blackwell.